A new job comes with a lot of excitement, trepidation, and change. While you're settling into your new role, it's easy to forget the reasons you got the job, and the things you need to do to make sure you keep it, grow, and move up the ladder. Here is a guide to the first six months on the new job, with what you should aim to achieve by month one, month three, and month six. How do things work? Who are the people you need to know? Who are the heads of the different departments, and what do they do? What are the challenges of the company? What are the strengths? Become the most inquisitive employee you can, and take notes. Learn from the people that have been at the company for years, but remember to take some comments with caution. Jaded employees can inaccurately color your view of the company. Also, don't be afraid to watch how people do certain tasks. Ask if you can shadow them; most of the time, they'll be flattered that you want their expertise. Whether you're working in a massive corporation or a mom 'n' pop shop, you need to make an effort to get to know people. Do it sooner rather than later, otherwise you may come across as anti-social or aloof. You don't have to be the life and soul of the department, but find the time to introduce yourself to the people you'll be working with on a regular basis. Learn about their roles, and how you can help each other out. You're not looking to make best friends, you're simply laying the foundation for a good working relationship. If possible, ask for an organization chart from human resources or your supervisor, so that you can see how you fit into the company. The first month may present unexpected challenges, but you have to take them all in stride. You've only been on the job around 30 days, so you really haven't had the time or experiences to become jaded and downtrodden. Remember, you are fresh blood and there will be an expectation for you to inject new life into the department. So, approach your job with zeal and energy, and try to turn every challenge into an opportunity. Crunchtime. The honeymoon period is over. Now, you're part of the team and should know what you're doing. By now, your employer will expect to see you start walking the talk you gave in the interview. In many ways, this is your make-it-or-break-it milestone. After three months, you'll have a pretty good lay of the land. Now, if you haven't already done so, you need to connect with someone that can really help you get ahead in the company. Some organizations insist on a performance review after three months. Some are more relaxed. If you haven't been invited to a meeting with your supervisor to discuss your progress, take the initiative and set one up. This is a great time to establish, on paper if possible, what the positives and negatives have been about your first 90 days. Hopefully, it's way more good than bad, but don't be afraid to ask about the latter. What can you improve? Where have you made a few missteps? Your boss will appreciate your candor, and will be more invested in you if he or she believes you genuinely want to be better. Set some goals, but also get down your achievements and your contributions to the company so far. This is also a great time to read your boss directly. Are you getting good vibes and positive body language? Are you hearing a lot of references to the future? This means you're becoming valued. As a newcomer to the business, you will have a fresh set of eyes on problems and solutions. You also aren't weighed down by the baggage of being told no a bunch of times. You will be amazed at what can be achieved simply by not having any history with the typical negativity or cynicism that can come from years of doing things the same old ways. What's more, even if your ideas don't come to fruition, the fact that you're really trying to push boundaries and make things happen will be seen as positive. It's not easy to speak up during the first few months. You're new, you don't know how a lot of things work, and you could be saying things that may sound naive, or are just uninformed due to your lack of company experience. After three months, however, you should have a good grasp of the culture, the business, and the successes and failures that have come before you. Now is the time to start speaking up and get noticed for the right reasons. Often the people that get the promotions aren't the brightest or the most talented — they're simply the loudest. They speak up, they say what they're thinking, and they are not a wallflower in the weekly status meeting. Do likewise. Don't speak all the time and have nothing to say, but don't stay quiet and let someone else make the point you wanted to make two days earlier. You're good at your job. You have great ideas. Now … let everyone else know that. By this point, you can breathe a little easier. You've been accepted, you will probably have a six-month review coming up, and you'll want to reinforce the positives you've achieved. However, this is no time to rest on your laurels. You're settled in. You've made a name for yourself. You're comfortable with your day-to-day tasks, and have a good feeling for the place. This is the perfect time to reconnect with some of your old colleagues and professional friends, for several reasons. Perhaps most importantly, friends who know you and what you do can really help when times get tough. After six months, the bloom will definitely have gone off the rose, and you'll start to see problems that now seem impossible to solve, or challenges that the culture make impossible to change. This network of professionals will be there for you, and could help you on those days you really need a boost. You have six months of solid work behind you (hopefully). It's time to use that bank of achievements to establish yourself as an indispensable member of the team. This doesn't mean bragging or constantly bringing up your wins. What it does mean is using what you have learned to have a positive and lasting impact on other initiatives. Your contributions on certain projects can be your "in" to larger developments. You have proved yourself on smaller jobs, now is the time to build on that success. From the foundation you have worked hard to establish, you can start looking at the next role. If you have worked wonders for the company, you could have built up enough validation for a raise and/or promotion even though you've only been at the company for six months. 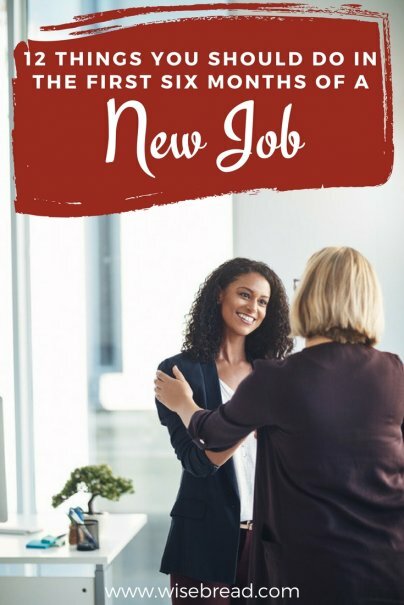 Take a look at the hierarchy, talk to the human resources department (if you have one), and find out the process and procedures involved in getting promoted or adding to your paycheck.